Domenica Marchetti is a former newspaper reporter who increasingly found herself more interested in what to have for dinner than the day’s news. Since then she’s written The Glorious Soups and Stews of Italy and Big Night In: More Than 100 Wonderful Recipes For Feeding Family and Friends Italian-Style. 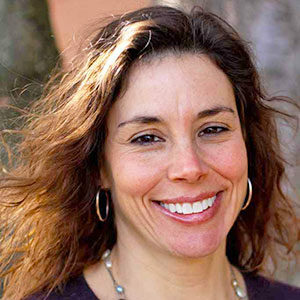 Her upcoming book, The Glorious Pasta of Italy, will be published by Chronicle in 2011. Our easy and elegant solution when you buy not-quite-spring spears of asparagus from the grocery store? Just add cheese and butter and bread crumbs. This is a frozen apricot mousse made airy thanks to the folding in of whipped cream. When sliced it’s beautifully flecked with golden bits of apricot.